WinADay Casino has one more birthday present for its players before its sixth birthday party concludes ad the tend of the month. It's another penny slot -- the third brand new penny slot to debut this month! Fruits & Bars is a traditional fruitie with a Free Spins feature. Like all of WinADay’s penny slots, the instant-play casino game is available online and in the new mobile casino for iPhones, iPads and Android phones and tablets. There have been free chips to celebrate the launch of each new game introduced this month (this is the third) and lots of birthday deposit bonuses. 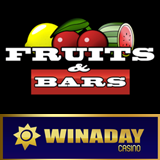 Adding it all up, WinADay Casino has given away more than half a million dollars in free money this month. And it's not over yet -- there's more to come this weekend! But first... let me tell you about the new penny slot. When three Free Spin symbol appear anywhere on Fruit and Bar’s reels five free spins are awarded. Players can win more free spins during the Free Spins feature for up to 20 free spins. Five Watermelons pay out 100X the bet. Blue Bars pay out up to 250X and five red Bars wins 500X the bet. Log on this Friday, Saturday or Sunday, June 28-30 and you'll find that a $7 free chip has been deposited in your account. Deposit bonuses are also available during this period to give you some free money to try the new game with. A 35% bonus will be added to all deposits.